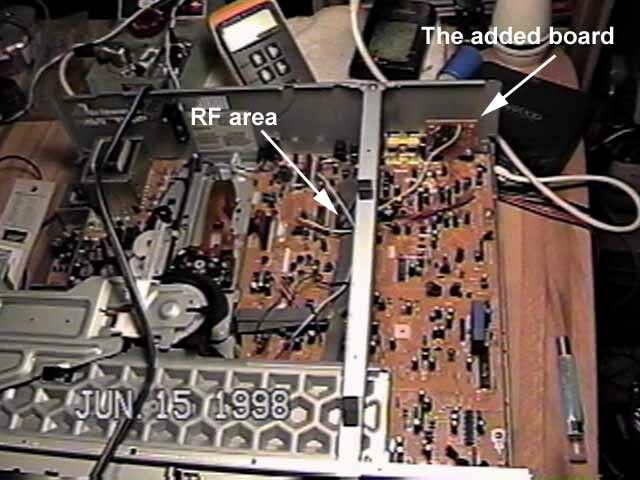 I had seen several web pages that described how to add an AC-3 RF output to older laser disc players. Finally I was ready to try it myself. Kevin Nakano's web page (link below) was very helpful. His page describes how to do the modification to a CLD-D702. My CLD-1090 is very similar to the CLD-D702. The board layout is slightly different and by describing in general terms how to get the RF tap I hope others with Pioneer CLD-XXXX models can figure out how to modify their own machines. (The board) One of the things that scares people away from doing there own mods is the fabrication of the circuit board. A custom etched board makes things easy to put together and minimizes wire lengths but a generic Radio Shack board can be used. The circuit is very simple and the Radio Shack board is small. The circuit board (part # 276-159) has several sets of 5 holes that are connected together. 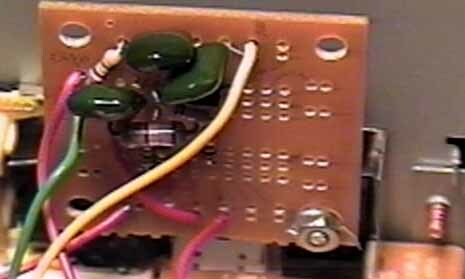 The best way to build the circuit is to choose a spot for the transistor and solder it in. Then using the schematic connect everything together as needed. My version of the circuit uses only 1 transistor, 4 resistors, and 3 capacitors. It can be assembled in 30 minutes. The picture to the right shows the opened laser disc player. Click on the picture to get the big version so you can see in general where the R.F section may be on your player. You can see where I mounted my board. I removed the screw holding the S-video jack and replaced it with a bolt and nut. The bolt holds the new circuit out of harms way. The circuit The basic circuit schematic is similar to circuit #2 from Nakano's web page. 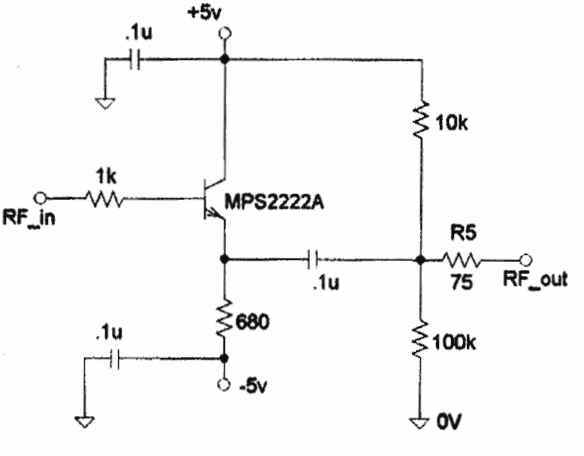 I used a MPS2222A transistor from radio shack. It has a wide (300MHZ) band width suitable for this project. The circuit is a Emitter follower/Common collector. This configuration gives a fairly high input impedance and a low output impedance. This way you won't load down the RF section of the LD player. Most of the resistors are available at radio shack. I made a 75 ohm resistor by putting two 150 ohm resistors in parallel. The 68 Ohm resistor radio shack sells should be fine. I used .25 Watt resistors when possible to save space. You may notice that I left the mute part of the circuit off. When I was building the circuit I wanted to try the main part out before I continued. I noticed that with out the mute circuit I had no noise when the player was in stop, pause, or skipping between chapters. I did notice some sound from the L.D. does come through when there is no picture (mostly between chapters). However the sound is not any louder that the volume you are playing the movie at. It is sound from the movie and not noise. That does not bother me so I never added the mute part of the circuit. If you do decide you would like to add the mute section check the links below. (RF tap) Finding the place to get your RF is the most challenging part of the adventure. You will probably see marks on the board like "RF level", 2.3MHZ, 2.8MHZ. The transistor you need should be located close by. You should find Q351 and Q352 right next to each other. 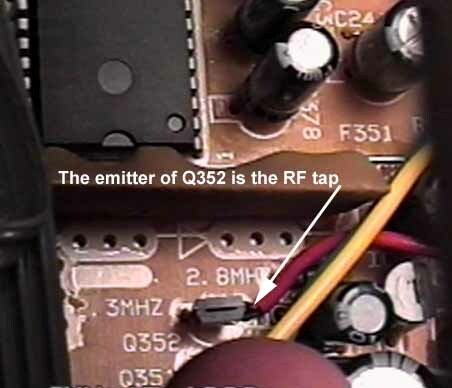 You need to connect to the emitter of Q352 to get your RF input to your board. Q352 should be a 2SC1740S. I noticed that the board on Kevin Nakano's page differed here. He used the position of the coil (LF353) to describe what leg of the transistor should be used. In the CLD-1090 and maybe others the coil is in a different location relative to Q352. Look at the transistor so you are facing the printed side that shows the 2SC1740S part #. The emitter should be the leg on the left. I looked up the transistor in the the NTE cross reference book to see what leg was the emitter. I also confirmed the books information with a meter. Not all CLD-XXXX players will have Q351 and Q352. My friends CLD-A100 was very different. The layout of the boards and part designations were not similar to mine because his player has Karoke and game options. There was a lot of surface mount components on the boards. There is a modification page specific to CLD-A100 listed below. (Power) The 5 Volts, minus 5 Volts and ground connections should be easy to find. They will be near by and clearly marked. I just wrapped and soldered a small amount of stripped wire around the jumpers that have the voltages on them. You will see that the schematic has .1uF capacitors going from 5V to ground and -5V to ground. Although not absolutely necessary they can help filter out high frequency junk on your power to your circuit. 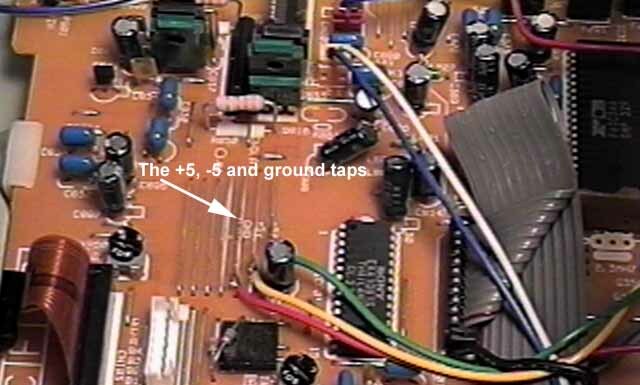 The capacitors should be mounted on the same board as your new circuit to be effective. (RCA output jack) Am I creative or just lazy? I decided rather than drilling a hole in the back panel of the player to mount a RCA type jack I would use a RCA jack already on the back that was not being used. My CLD-1090 has 2 RCA jacks and a DC jack that are there in case you want to plug a VHF adaptor in. 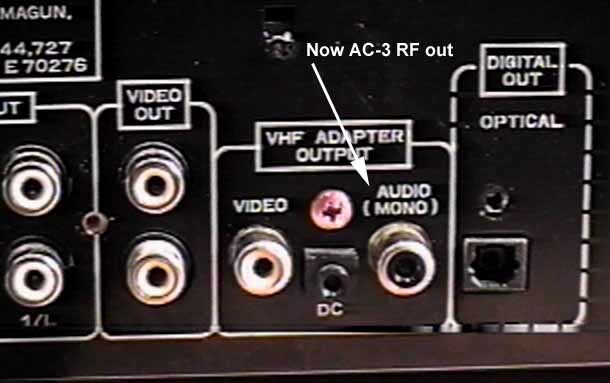 The option is there for people that don't have separate audio video jacks on their TV. Pioneer probably left the VHF A/V output as an option because most people that own a laser disc player are going to have a TV with composite inputs and probably S-video inputs. I cut the metal strip that goes from the Pioneer circuit board up to the center of the VHF audio mono jack. I then fed the AC-3 output of the new board to the center of that RCA jack. The newly transformed RCA AC-3 output jack is already connected to ground. 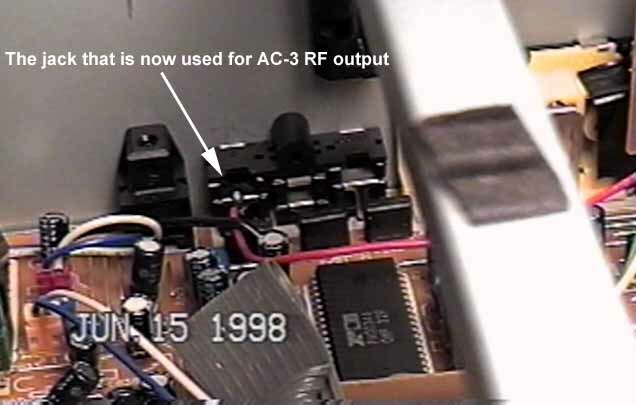 Although most circuits out there show the AC-3 RF output connected to circuit ground and through a capacitor to the chassis ground the mod works just fine using the existing RCA jack that is connected to ground through the chassis. (Measurements) You should have about 4.5 Volts at the output of your AC-3 RF jack. 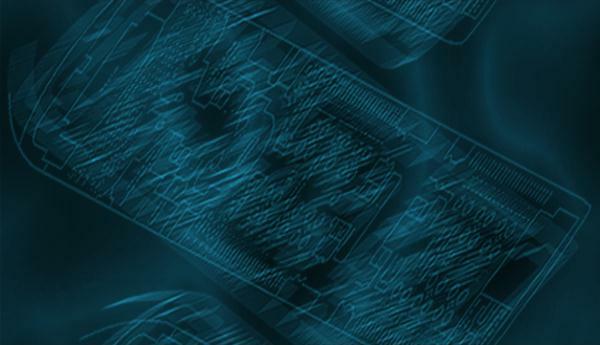 Look at Kevin Nakano's web page for some good pictures of the AC-3 wave form displayed on an oscilloscope. Using a Textronix 453 (it is about the same age as me) I had just over 1V p-p with no load. There is really no need for an oscilloscope but it is nice to check the output. Good luck!